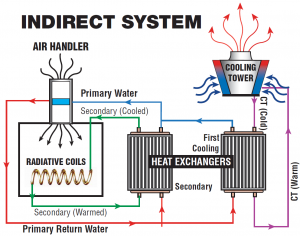 An Indirect system is designed so that there is no direct contact between the air and water that is being cooled and has 2 different fluid circuits. This kind of a system is also called a Closed Loop or Closed Circuit system, since they do not allow the water to come into contact with any outside contaminates. This keeps the water much more pure due to the lack of foreign substances being allowed to enter the system. 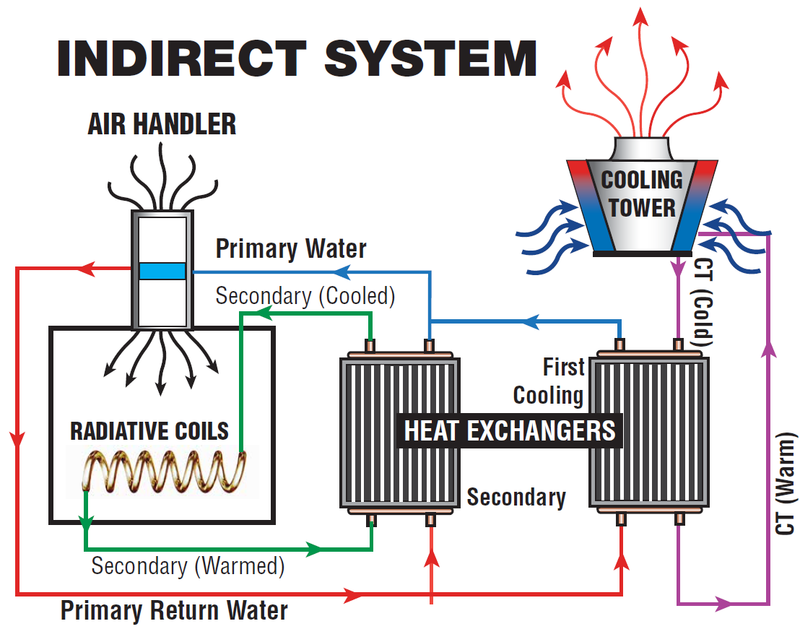 A cooling tower with an indirect system involves no contact between the air and the fluid being cooled, and is sometimes referred to as a Dry System. This tower has two discrete or separate fluid circuits. One type of indirect system has the fluid from the first circuit recirculated on the outside of the second circuit. The second circuit houses a matrix, usually a bundle of tubes, through which the hot water is passed. As air is drawn through this, cascading water provides evaporative cooling, similar to an open cooling system, except that the cooled water is never allowed to make direct contact with the air. Another indirect cooling tower system involves a separate heat exchanger and an open cooling tower. The heat exchanger also prevents water on the hot side from making direct contact with the air. This type of system will allow the heat exchanger to be located inside, thus protected it from the environment. An Indirect Evaporative Cooling system passively cools the supply air by passing over a medium that has been directly evaporatively cooled on an adjacent but isolated side. Thus no water loss is associated with the cooling process. The whole idea is simply to prevent contamination of the water in the system and it is used in food processing plants, hospitals and facilities with similar needs. This type of design is very adaptable to different situations and one of the safest cooling processes. Another advantage of an indirect system is because the processed material and the coolant are contained in separate circuits it is not necessary for them to be compatible, as is required in open systems. This isolation is what prevents contamination which can be harmful to human health and reduce operational efficiency. Legionnaires Disease is one deadly contaminate that can potentially be prevented in a closed/indirect system. Initial costs of closed loop cooling towers is generally a bit more than direct cooling tower systems. In the long term however, the lower maintenance costs make indirect cooling a more cost effective solution, usually. There is no loss in fluids as they are returned to circulation and not subject to evaporation, saving water resources. The benefits of closed loop system allows their use in many critical commercial and industrial settings where contamination can be a hazard. While there are many variations on the available systems, such as reversed operation where the coolant runs through the exterior matrix surrounding the hot liquid, but the basic heat exchange process remains the same. Where there is no need to keep the systems separate, a Direct Cooling System can be used. Read more about them here.